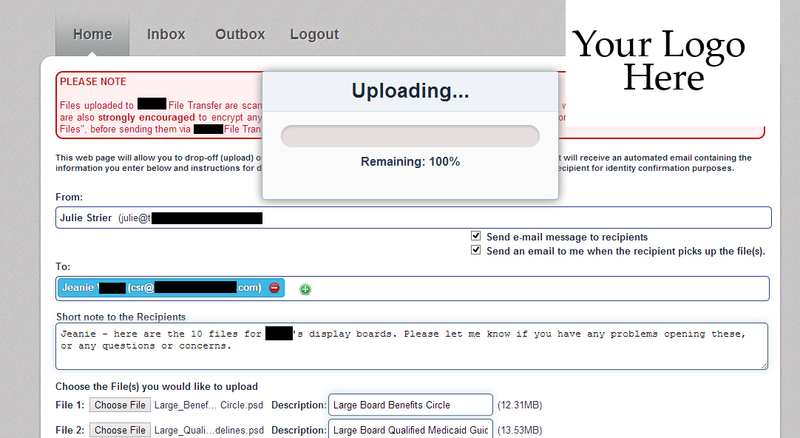 Screenshot of In-House File Transfer Service – sensitive information redacted. You and your team worked hard on a project, and now you’re ready to deliver it to the client. But the deliverables include several large files that are too big to send via email. What do you do? If you are like many businesses, you’ll probably turn to a file transfer service, like Drop Box, SkyDrive, or Google Drive to share the files. However, there are a ton of inherent problems with going this route, most of which involve lack of security and control on a third-party system. But did you know that there is a better way to transfer files? You could host your own large file transfer service in-house and remove many of the issues involved with third-party services. Here are just a few of the many advantages to running your own file transfer service. When large file transfer service software runs in-house, transferring files is much faster for you and your staff. With a service of this type everything remains in-house, which means whether you’re delivering files to a client, or downloading files a client sent to you, the files are already on your network. Instead of you having to wait on a service and the slow speed of the internet to access your files, simply access the large file transfer service and grab what you need quickly, over the faster speeds of your internal network. However, this is a benefit for in-company users only, as employees or clients logged into the service remotely will still be limited by their internet speed. While the third-party file transfer services work in a pinch, there are usually stipulations on the amount of data you can send for free. Most services give you about 2 gigs of storage space before charging you. However, 2 gigs doesn’t go far when you’ve got large files to send somewhere. Instead of paying the third-party provider to increase your tier level to allow you to send larger files, why not setup an in-house system? Typically, hosting your system in-house is cheaper than what you would spend with the third-party providers, and you won’t ever have to worry about which tier your account is on, and how much data you can send. With an in-house large file transfer service, you can send up to 35 gigs at one time without paying any extra. And, there are no reoccurring monthly fees outside of your normal network maintenance costs. By hosting your file transfer service in-house, you’ll also gain some extra security features. With third-party systems, your information and files live on someone else’s servers, and you don’t have control or say so over what they do with their computers. Sure, they may have everything outlined nicely in their Terms of Service (TOS), but when it comes down to it, how much of a guarantee is there really that your data is safe? Instead, keep your data on your network and you’ll never have to worry about what’s going on with your files. If a hacker wants to attack a file sharing system, who are they going to target? Your company, or someone big like Microsoft (who runs Sky Drive)? You guessed it, they’ll go after the big guys every time. In this way because you’re a small fish in a very large pond, you won’t have to worry about being attacked the same way the big guys do. Oddly enough, it’s because of your obscurity that your security is increased. You’re simply not on their radar. However, in the event that someone does try to attack, your files are protected behind your firewall, safe from intrusion. These are just a few of the reasons why we prefer an in-house large file transfer system to a third party alternative. Do you have concerns about hosting a file transfer system on your network? Give us a call today. We’ll be happy to answer any questions you might have. Julie Strier is a freelance writer who likes to help make large file transferring easier. Email: julie@mybusinesswriter.com. Website: www.mybusinesswriter.com.